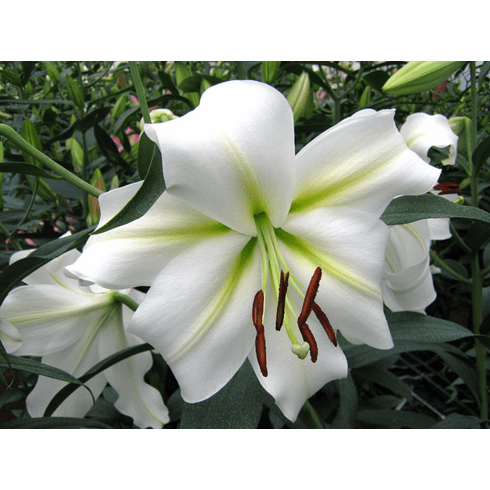 A selection from a cross between L. longiflorum (Easter Lily) and an unnamed white Oriental breeder. Cream, not white, best describes the color in our cool climate but the warmer it gets, the whiter these flowers become. 'Gizmo' has an extended green nectary down the center of each petal for contrast on this smoothly textured lily. Both a good mixer in bouquet and a terrific garden lily for combining with the Oriental-Trumpet or Orienpet Hybrids like 'Conca d' Or' or 'Lesotho'. This is our favorite of the Longiflorum x Orientals (LO) hybrids. 3 to 4+ Feet. Late July / Early August Flowering. Fragrant.